Log in to get emails when Friday Gladheart has something new. 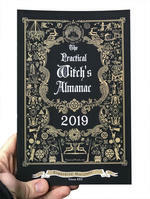 Friday Gladheart is the author of The Practical Witch's Almanac, an annual personal planner and guide that has been in publication for over 22 years. Her articles and DIY projects have appeared in major Pagan, Wiccan, and secular publications. For over 30 years she has worked as a “private pen,” creating books and articles for others as a ghostwriter, but has recently come out of the “broom closet” to author her own works. Friday founded PaganPath.com in 1997, the oldest and most highly respected online academy for Witchcraft, tarot, and herbalism. She spends most of her days teaching, writing, and creating websites while developing a non-profit, organic teaching garden and sanctuary near the oldest National Forest in the southern United States. Sign up for Friday’s newsletter to hear news, writing thoughts, book recommendations, etc. !